After six months of traveling, 30+ homes/beds, our nomadic family have a new home! 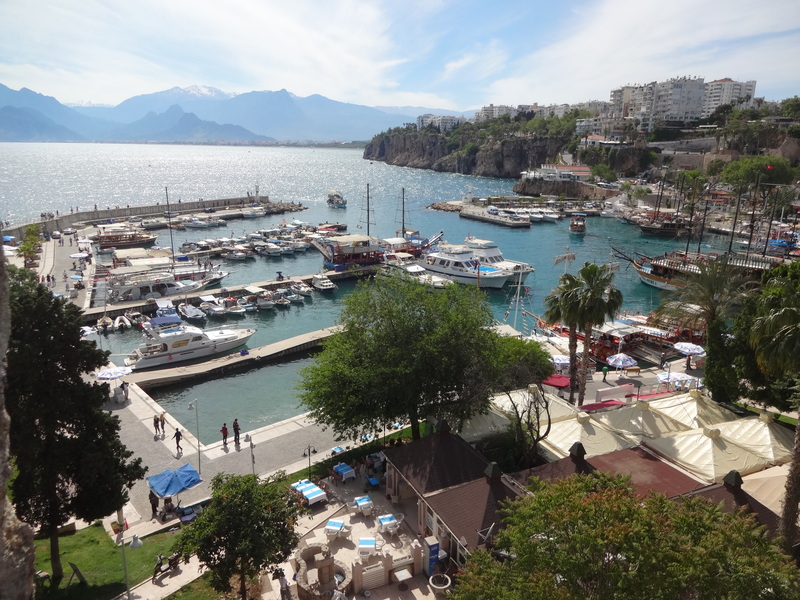 We have settled in Antalya, Turkey, on the Mediterranean Coast. We love it here! Mediterranean. Mountains. Perfection. This was taken in April…notice the snow on the mountains! 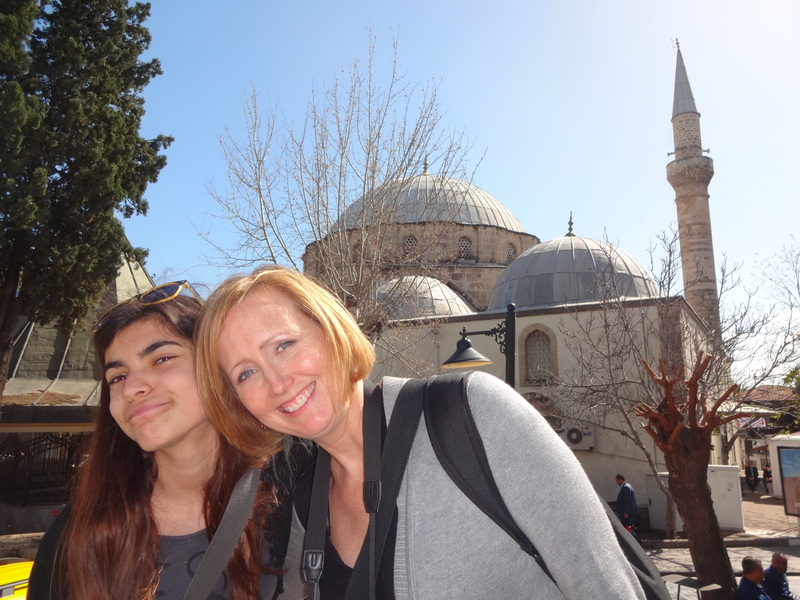 I have been in love with Turkey since my first visit more than 20 years ago. I was traveling with my best friend from college (a ten month backpacking low budget trip around the world) when we discovered Turkey without planning it ahead of time. 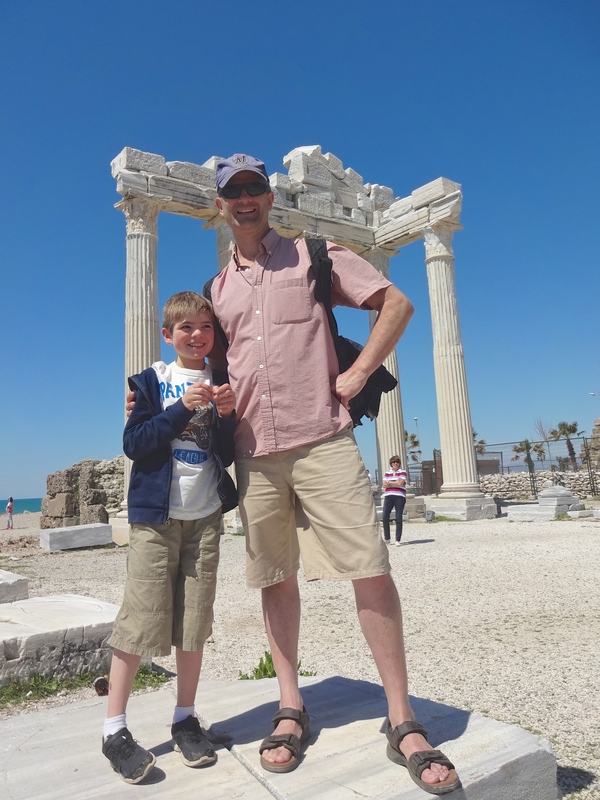 As we met other young college-aged travelers, and they heard that we were heading for Europe and Greece, many said, “Are you going to Turkey?? You gotta go to Turkey! !” Being the Americans we are, Turkey wasn’t on our radar. 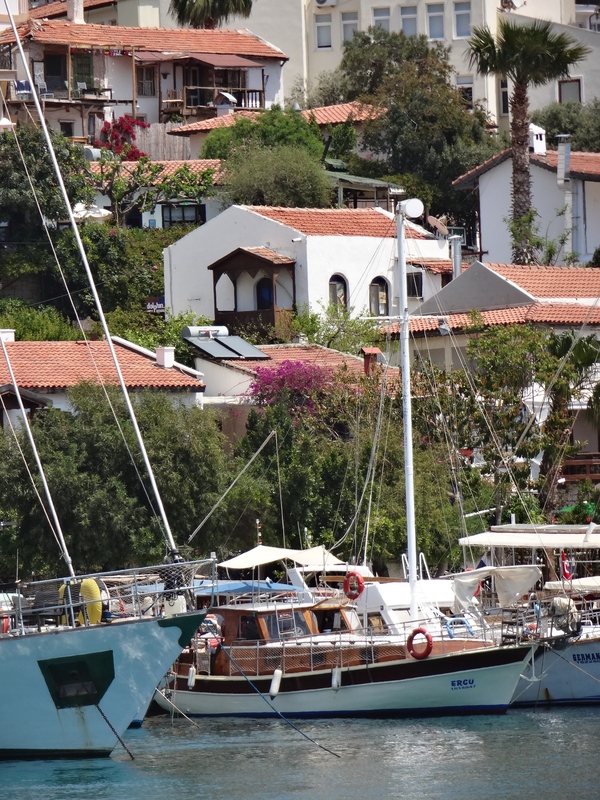 Turkey is the vacation hotspot for Europeans, Russians, and many other nationalities. We decided to see for ourselves what everyone was raving about. So we took a boat over from Greece to Turkey. I was hooked immediately! The water is beautifully clear, like a swimming pool. Anyone who has traveled to Turkey needs no explanation of why I fell in love with this country. For those of you who haven’t yet been here, it’s the friendly, welcoming people; the delicious food, the abundance of fascinating archeological sites: the miles of beautiful beaches, the fascinating city of Istanbul straddling two continents, the culture, the sunshine…I could go on and on! 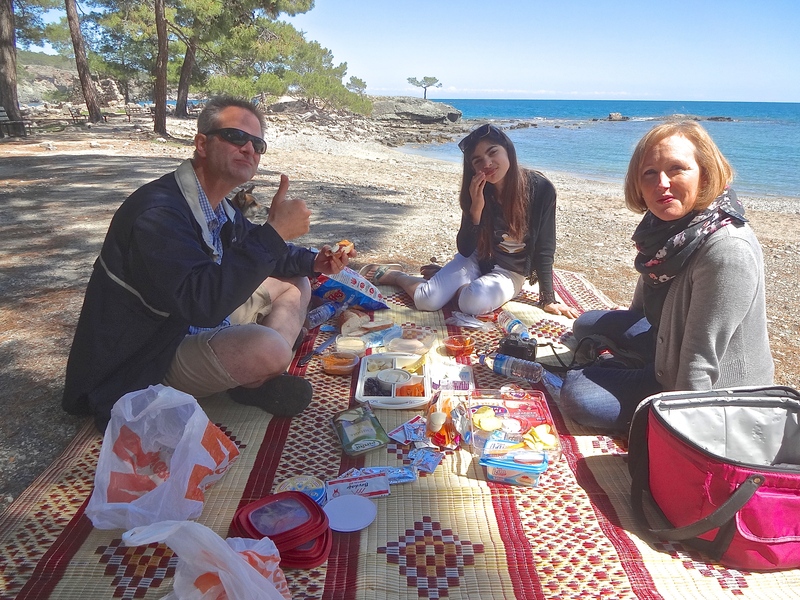 There are even amazing archeological sites on beautiful beaches, where you can enjoy great food with friends. 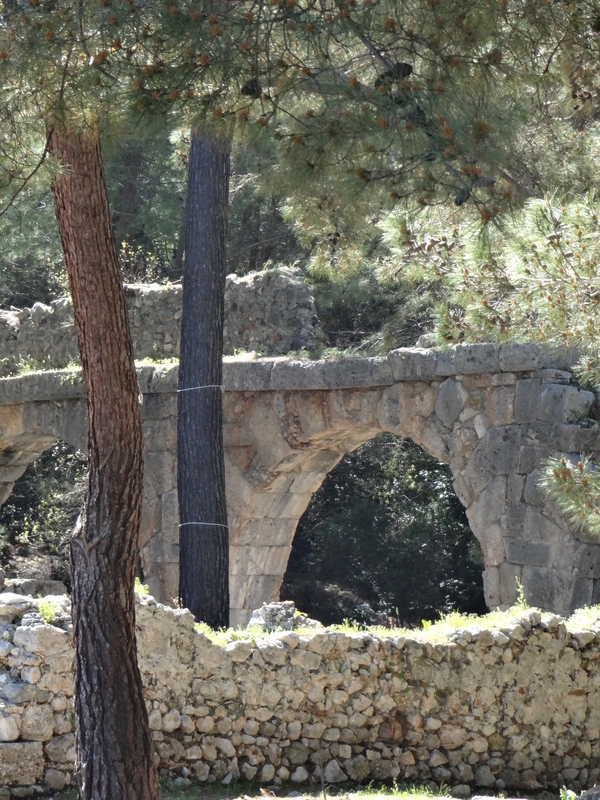 The ruins of ancient Phaselis sit amongst three beautiful bays, nestled in a forest. It’s no wonder the Romans decided to build here! 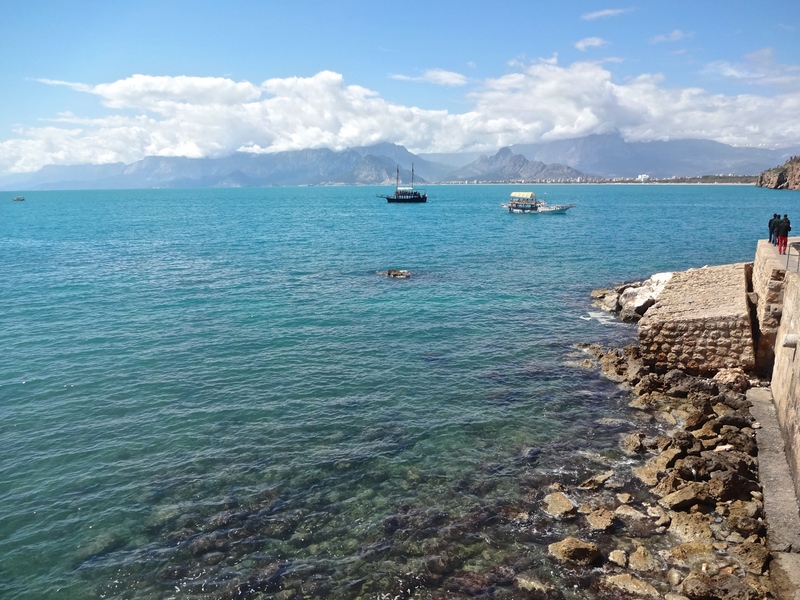 We decided to move to Antalya after coming to visit in February 2014. We discovered that it has an international airport, with direct flights to many cities in Europe and the Middle East. Istanbul is just a one hour flight away. 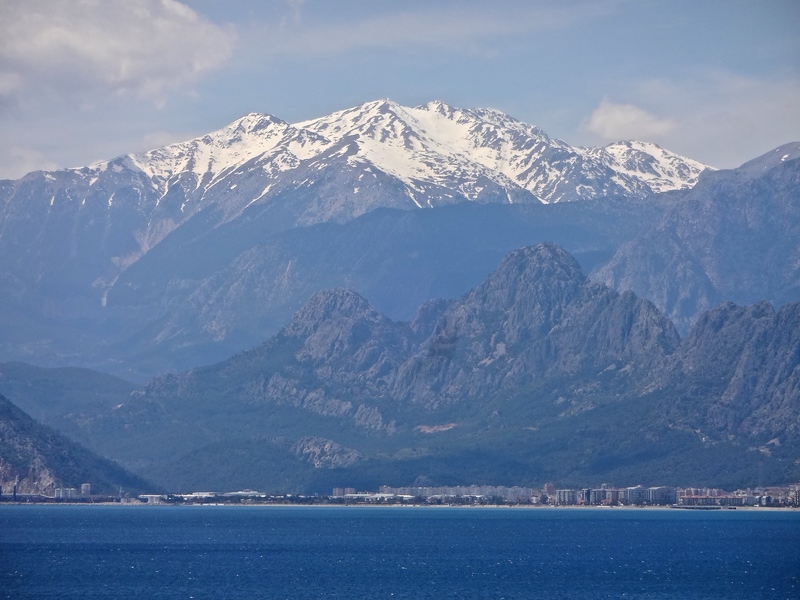 Antalya is the main city in Turkey’s Turquoise Coast. Did you know that it’s one of the top five travel destination in the world??!! More than 10 million people visit here every year!! Most go to the numerous all inclusive resorts along the beautiful Mediterranean coast. 300 hundred sunny days a year sounds pretty good to those coming from cooler, European climates! This view is just a short walk from our flat! 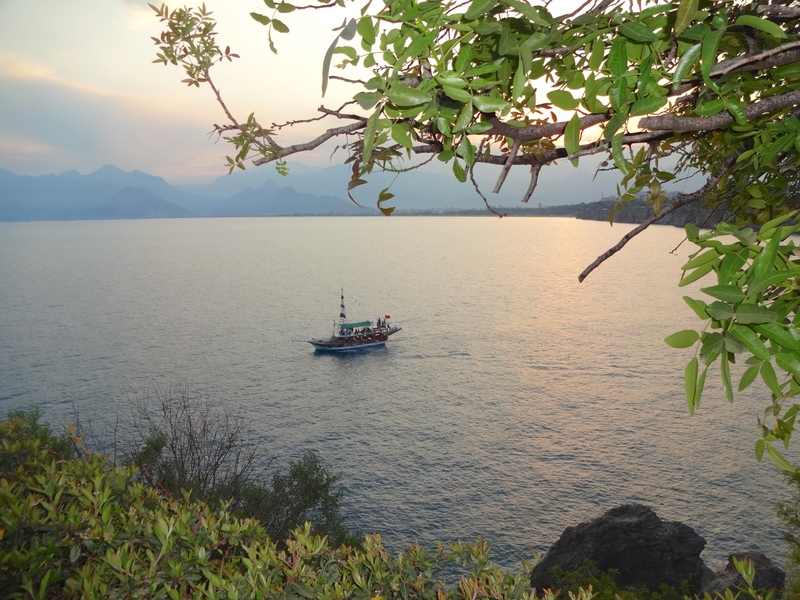 Antalya’s old city of Kaleici is super charming. It’s small, and easy to navigate. 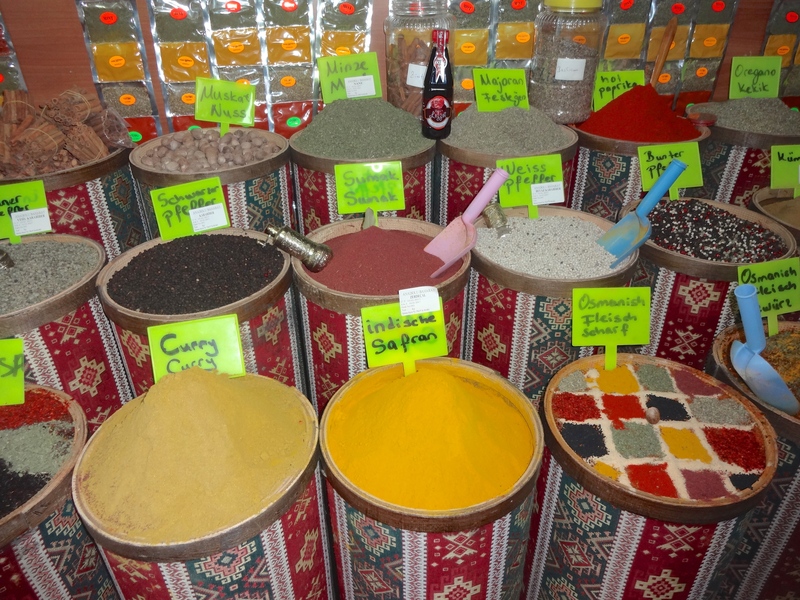 There are, of course, all the touristy shops selling carpets, Turkish delight, spices, souvenirs, and trinkets. You can get lost in the windy streets full of restored houses from the Ottoman days. However, as long as you head downward, you’ll end up at the lovely port. Going on a boat ride ride is a must-do. Be sure to negotiate the price of the boat ride! Prices go down as a boat is about to pull away. Children are free. 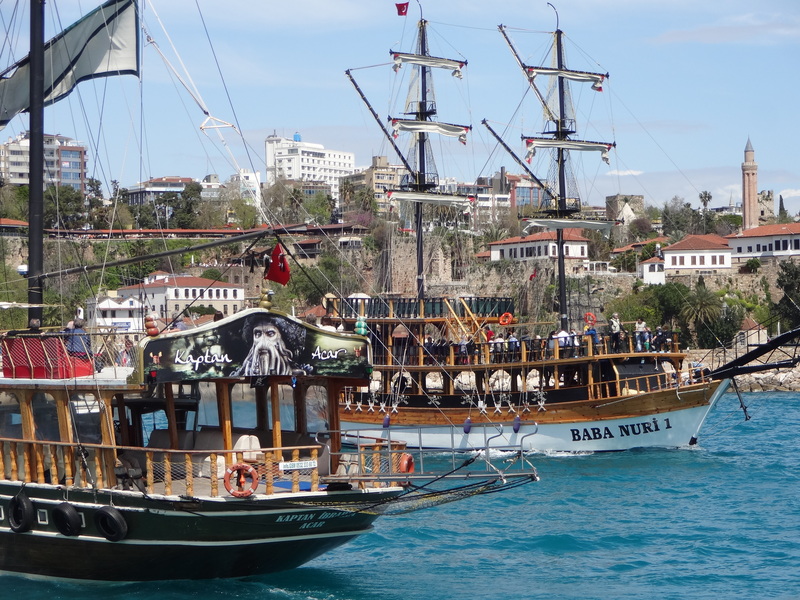 There are lots of boats to choose from; lots have a pirate motif. 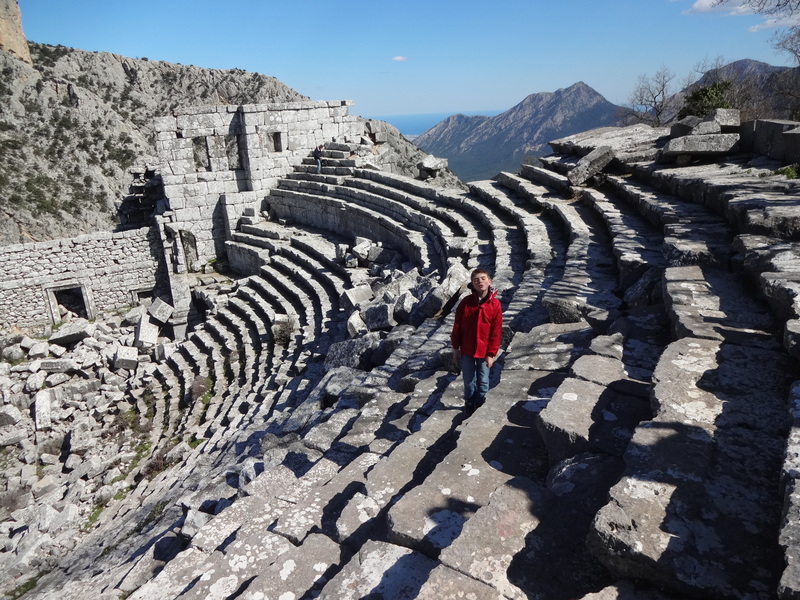 There are many historical sights from Antalya’s multi-layered past. We have had a steady stream of visitors. It is fun to show friends our new city! 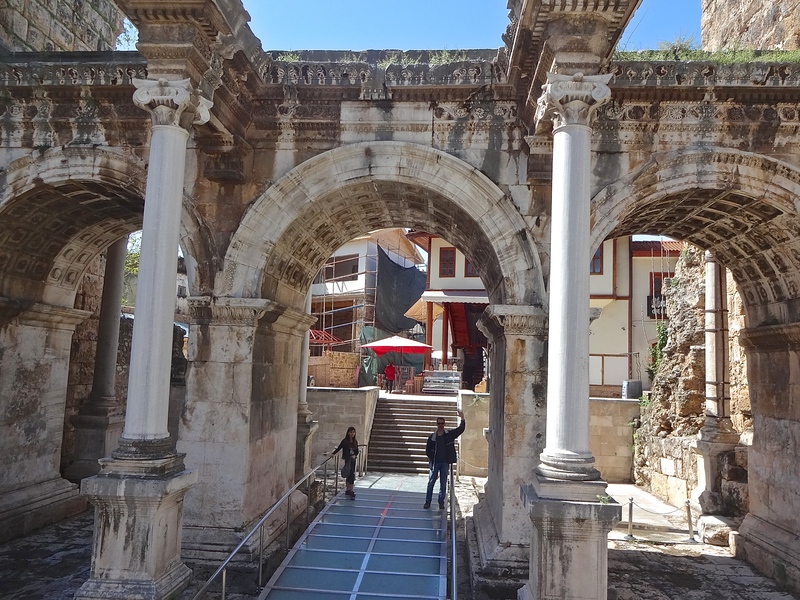 Hadrian’s Gate….built in honor of Emperor Hadrian’s visit here in the second century. Side, a lovely sea side town with fascinating Roman ruins and a long sandy beach. Phaselis is great to take in the ruins, enjoy a picnic by the sea, and have a swim. Come see why more than 10 million people come here for vacation every year! We went to this lovely seaside town last month and we are looking forward to returning next week!